Irene Leland has been named one of “New Music Artists Who Are Making Moves” by the Svelte Media Company in April 2015. Irene Leland has been named one of “Who’s Hot In Music In 2014” by the Marquix Global Network. She can captivate a room with her voice, guitar and poetic lyrical style. Now, Irene has proven she can captivate global audiences with the success of her crossover radio hit ‘Loves Around The Corner’. 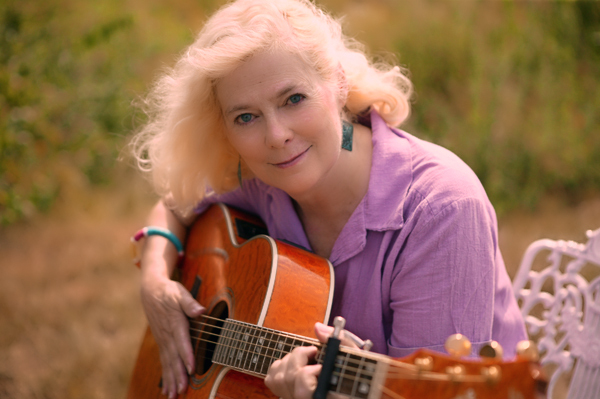 Irene Leland is a solo artist who has enjoyed composing and performing folk, pop and soft rock songs for many years, ever since she wrote her first song at age nine on the piano. She also plays guitar and creates jingles and theme songs. Now it appears that Irene has struck a chord in popular audiences with the simplicity, honesty and lyrical quality of her debut radio single ‘Loves Around The Corner’. Reporter Blake Wright caught up with this award-winning folk artist to learn more about her story and how this remarkable connection occurred. IRENE: I first discovered my love of music at age nine, when I would sit down at the piano to presumably practice my piano lessons, but I would invariably start playing around with the keys, creating and singing my own melodies. When I got my Ukelele at age twelve, I went wild making up songs, and it became even more fun when I “graduated” to getting my first guitar! BLAKE: Your song ‘Loves Around The Corner’ has been a big hit on radio for its third straight month. What was your initial reaction when you first heard your song playing on radio. BLAKE: What was the inspiration behind ‘Loves Around The Corner’? Was there someone in particular you were writing about? BLAKE: Would you say that the mood of your other songs is in the same vein as ‘Loves Around The Corner’? IRENE: In many ways, my other songs are in the same general vein as this one, as I have an inclination to express positive emotions and to imply a certain kind of story that wraps around the song. Even though some of my material is on a melancholy note, I usually lean toward an uplifting theme. IRENE: I would characterize myself as a very open, down-to-earth and dedicated musician who says/sings it as it is, whether it be light hearted, spirited or with deeper meaning. IRENE: Yes, I come from a musical background. My mother, Dorothy was a superb piano player, and she would often fill the house with her classical music from Mozart to Bach on her Baby Grand. Her professors at Sarah Lawrence College had confidence that she could become a concert pianist. She did not choose that route but always continued her love for the piano throughout her marriage and raising her children. My father, Austin was a happy-go-lucky musician and matched my mom’s music with playing his xylophone and his “one man band”. At Princeton University, he was part of the famous Princeton Triangle which toured the states every year. One of his acts was playing the xylophone and tap dancing at the same time! He also directed and wrote the score for the show. So, he was extremely happy when I developed a love of songwriting! BLAKE: What do you find most rewarding about being a musician? What do you find most challenging? IRENE: The most rewarding thing for me about being a musician is that exhilarating fulfillment that I feel as I’m performing, when I have made a pleasing connection with the audience. It is a very satisfying two way vibe that makes it all worthwhile! My other rewarding feeling is the marvelous sensation of release as I’m composing a song! As far as most challenging, I would say it is living up to my goal of providing the best for a musical project, whether it is doing research and putting together a theme song, writing a promotional jingle that fits its criteria or composing a personal song for a special occasion! IRENE: My role models in music are definitely the Beatles and Peter, Paul and Mary! Initially, the Beatle’s songs were a huge inspiration!…so much so that my friend/music partner, Alice and I formed our duo in 1964, imitating the Beatles and then becoming the “Weavils”, creating and performing our own songs! Then, after greatly admiring Peter, Paul and Mary and feeling a common chord with them, I had the thrill of meeting Paul in 1965! Although their group was not in need of new material at the time, I was so honored that he listened to several of my songs! He said, “You are into something! Keep on writing!” I certainly did keep on writing for many years to come, even though I was juggling between engaging in several careers as well as raising two boys. BLAKE: What advice would you give to young, aspiring musicians out there who are unsure and need guidance? IRENE: My advice to young, aspiring musicians is to never give up. Follow your dream. Go with your flow. But mainly, just be yourself! It will all come through naturally in your music. Believe in yourself. Transfer that to your songs. Define it and enjoy it! BLAKE: What’s next for Irene Leland? Is there a new single in the works? If so, what can you tell us about it? IRENE: I am happily creating more and more songs! I am more than pleased that my two latest songs ‘Naturally’ and ‘Rocky Baby’ have already received award recognition. Now I have a new song ‘You Found Me’ in the works that I am especially excited about! When I recorded it a few nights ago, I felt a surge of goose pumps, as if I was inside my own head hearing it for the first time and being swept up by its energy and sincerity. BLAKE: Thanks for taking time out to share your story with me. I wish you continued success and good luck! Songs include “Goin, Goin, Gone”, “Love’s Around the Corner”, “Wishing Well”, “Love Me A Little”, and currently, “Swing On By” and “A Star Is Missing”.